Worked hand in hand with owners to develop this first in North Carolina LEED for Homes Gold-rated home. Looking for an appropriate driveway route to ascend approximately 75 vertical feet in 425 horizontal feet, preparation of variations on 3 contrastingly different grading schemes that led to a total of 17 driveway grading scenarios in order to arrive at the best solution for cconstruction. Working with owners and New Energy Works, grading and drainage design and layout design drawings for a home site that required several schemes, the orientation and elevation for which were reviewed in detail by owners. As construction of the home continued, prepared multiple landscape plans for, initially, the re-vegetation of graded driveway and home site slopes, and, secondly, for planting of the home foundation and site perimeter. The “nature-scape” was created using an ecosystem approach utilizing only plants native to the existing ridge habitat that blends the home to the site. Over the following months the rigorous site reporting requirements for LEED certification were completed successfully. Site details included a Large auto court designed to accommodate multiple vehicle parking for weekend visits and summer residence by family and friends from Atlanta. A separate drive leads to home service areas and to golf cart parking garage on lower story. The curvaceous entertainment terrace accessed from the lower level includes a 4-hole putting green and pervious paving terrace (center) for storm water detention as well as construction detailing for the floating Ipe-wood benches hung from the garden wall shown. 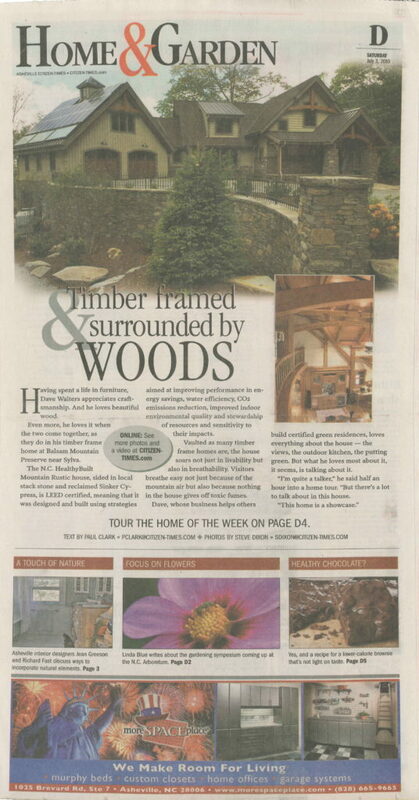 Asheville Citizen-Times Home of the Week for July 3, 2010.